Learn to play like me! For my adult students, I have a more flexible curriculum according to the specific goals of the student, while also providing strong technical skills and good form. Examples of this could be adding more bowing styles for a student who is interested in Irish fiddle, or working in improvisation with someone who wants to play Bluegrass. I have been successful with adults who have never played an instrument before, with adults who took violin in middle or high school and then quit, and also with adults who have a strong classical background and want to learn to fiddle. Some former fiddle students of mine--the gal to my immediate right is applying for colleges right now! For more information on violin/fiddle lessons for you or your child ages 5+ please contact me directly! I would be happy to chat with you about any questions or concerns you might have, or to arrange a free 30-minute interview/trial lesson. I have been teaching violin (fiddle) to children for about 12 years, since I was a teenager myself. 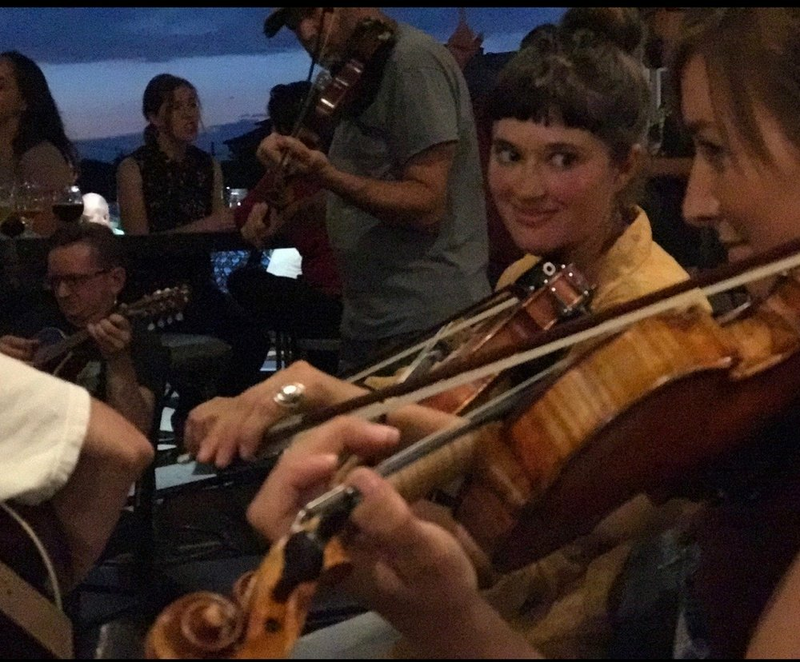 I teach a blend of classical Suzuki method and traditional fiddle styles including (but not limited to) Old time, bluegrass, Irish, and New England. It is my personal philosophy that some of the best violin techniques have been developed for classical musicians, but fiddling brings a vital element of fun and spontaneity that classical music does not give every student. Lessons in my studio include a strong emphasis on learning by ear, but also may introduce music reading, and require a fair amount of parent involvement for children. My rate is $60/hour, and $30 per additional half hour. I currently have a one hour minimum in order to be able to travel to my students' homes. With one of my adult students at her first jam session! I look forward to helping you or your child to develop your musical education!